I have been aware of the work of this Bristol artist for some while now, but didn’t know much else about him. Well a little stroke of luck…a delay to my usual bus…encouraged me to walk home after work and I decided to take a slightly different route. As I dropped down the steps from Park Street into Frogmore Street I saw this beautiful display of foil butterflies pressed into the road tarmac. The gentleman in the pictute is actually the artist, Duncan McKellar, who likes to bring a smile to the citizens of Bristol with his unusual artistic displays that appear from time to time. I guess one might describe him as an installation artist, but what he does brilliantly is bring to life many of the things we fail to see around us, such as statues and trees and puts them front and centre of our consciousness with his art. I particularly like this foil piece because it is an unusual experimental technique which Duncan was trialling. We stopped for a lengthy chat, and I will certainly be following his artistic adventures with great interest. More from Duncan to come soon. This door belongs to the Hatchet Inn, the oldest pub in Bristol which dates back to 1606. It is said that the pub is haunted and that the door is made of human flesh, beneath the tar. Hmm. This collaboration rounds off, for the time being, the different works of Bristol artists in this area. The wall in question is directly below the Banksy, and adjacent to the 45RPM and RichT wall. 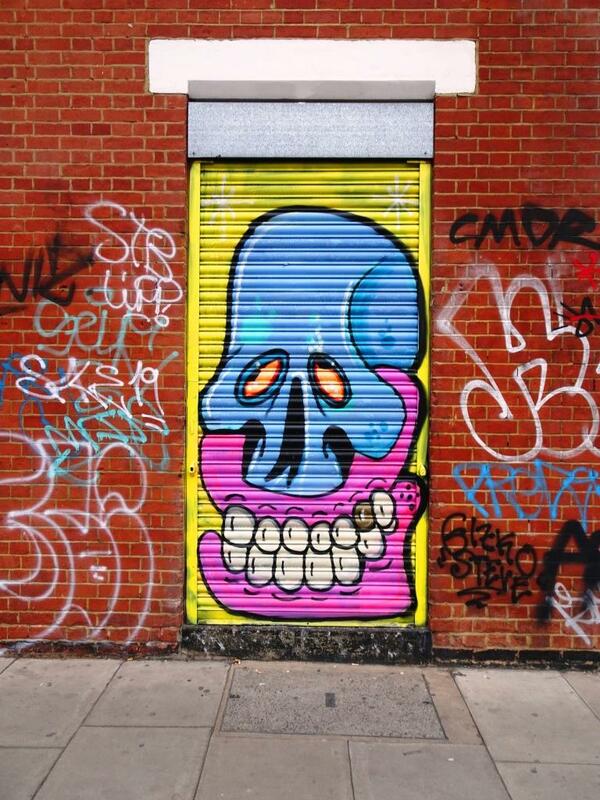 It is a cheerful piece by Silent Hobo, Cheo and Deam (who seems to sign himself with variants of Deam, Deamz or Deamze). Each artist has sprayed a separate part of the wall in their own distinct styles. The wall has been repainted reasonably regularly, although this has remained for a couple of years. I fully expect it will change again this year. The wall gets a load of attention from visitors who come to look at the Banksy above it. I am fond of this work. 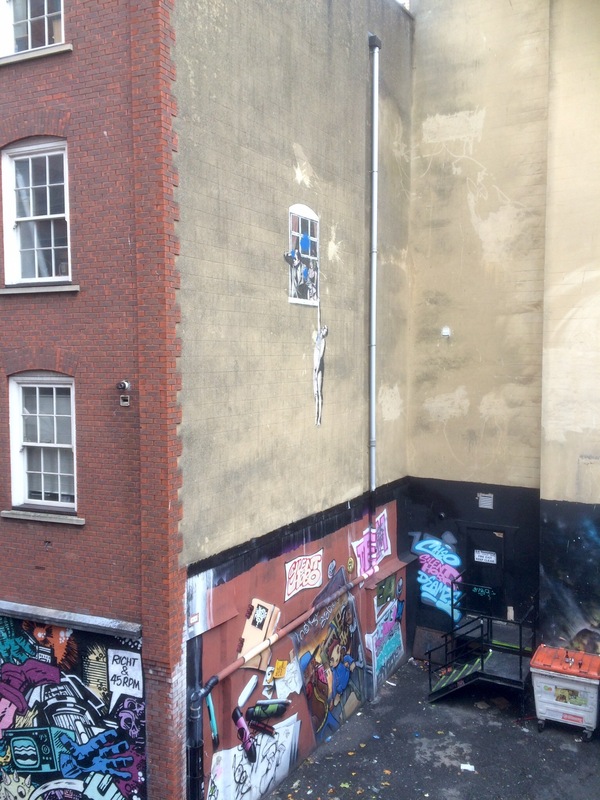 This busy mural is in great company, with a Banksy and JPS only meters away. It is by 45rpm and Richt. Although 45rpm has a lot of work around Bristol, and a website, it is difficult to dig up very much about him although he does have a post about his work with Richt on pattern collage murals. 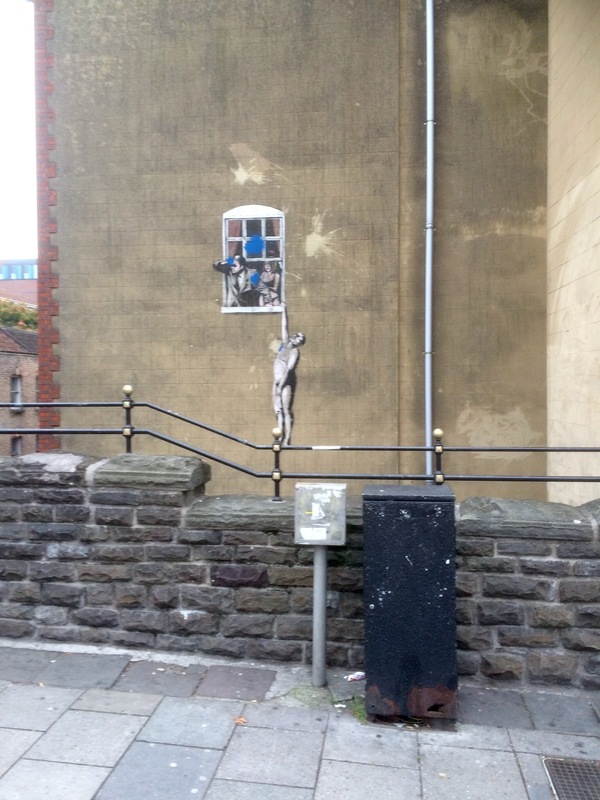 Richt is also a Bristol-based artist and illustrator whose works are also scattered around Bristol and the Westcountry. The pair appear to collaborate a fair bit.